If you’ve heard of the Centre Pompidou before, it’s likely because it’s one of the most famous art museums in Paris. 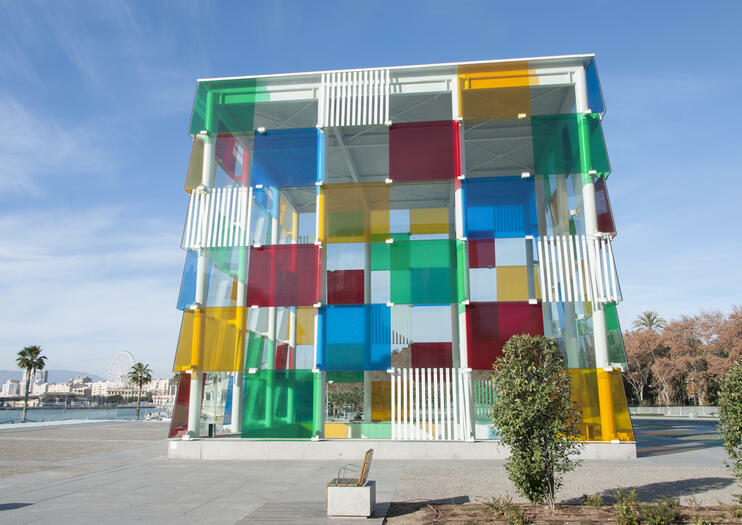 The first one to exist outside of France opened in the heart of Malaga, Spain — a modern building that sits strikingly as a cube with multicolored and clear glass windows. The contemporary space contains both a large permanent collection and smaller temporary exhibits. The museum houses nearly 100 unique works from the 20th and 21st century, all of which are grouped in one of five themes: Metamorphosis, Cubism, Politics, Self Portraits, and The Man Without A Face. Famous artists featured include Picasso (who was born in Malaga,) Frida Kahlo, Francis Bacon, and René Magritte, among others. Dedicated solely to modern artists of this time period, it operates as a smaller scale design of its sister museum in Paris. Though it is newer than other sights, it has received high acclaim and is already part of most of the city tours of Malaga. You’ll find the Centre Pompidou Malaga in the new port areas Muelle Uno and Muelle Dos, facing the bay. It is open Wednesday to Monday (closed Tuesdays) from 9:30am-8pm. The permanent collection costs €7 and the temporary €4, or you can obtain entrance to both for €9. For children under age 18, admission is free. Parking is available on site, and multiple public and touristic bus routes stop nearby. If you’re modern art lover in Malaga, don’t miss out on a visit to Centre Pompidou, famed for its striking multicolored facade. Save time with a skip-the-line ticket to the contemporary museum, which features masterpieces by the likes of Brâncuși, Giacometti, Bacon and Picasso. Your admission ticket also includes an audio guide designed to enhance your experience of the gallery space. We connect you with Malaga!Visit, explore, discover this cosmopolitan city in a Twizy, electric car, that will help you with your audio guide with GPS. You will know where you are and where to go.But yes, at your pace. Stand where you want (parking and "zona azul" are free for you) and delights with its corners that otherwise would stop visiting: neighborhoods, viewpoints, beaches ... you will have unique pictures.AUDIO Multilingual GPS guide explains the points of interest in your path when you travel the selected route.Enjoy, look and let them look at you. Your Twizy will attract attention. Are you ready?This 100x100 electric car with 0% emissions with 2 seats is easy to drive and park.Ah! And without fuel costs, of the kilometers you do.